Heute ist chinesisches Neujahrsfest. Manche interessanten Ereignisse finden hier statt. Später ereignet sich einen Drachentanz, und vielleicht werden andere interessante Erlebnisse geschehen. Es kommt ein gutes Jahr vor. Dieses Jahr will ich einige Zeit in Afrika verbringen. Meine größten Sorgen sind die Mordrate, Verkehrsunfallrate und Gelbfieber. Vorher muss ich die aktuelle Situation im Internet prüfen. So weit wie möglich will ich mit dem Zug reisen, und die Länder mit Gelbfieber vermeiden. Der Anfang der Woche habe ich eine gebrauchte Waage gekauft. Sie misst nicht nur das Gewicht aber auch das Prozent von dem Fett. Vor meinem Frühstück maß ich mich und es zeigt 28% Fett. Ein Neujahrvorsatz muss einiges Fett zu verlieren sein. 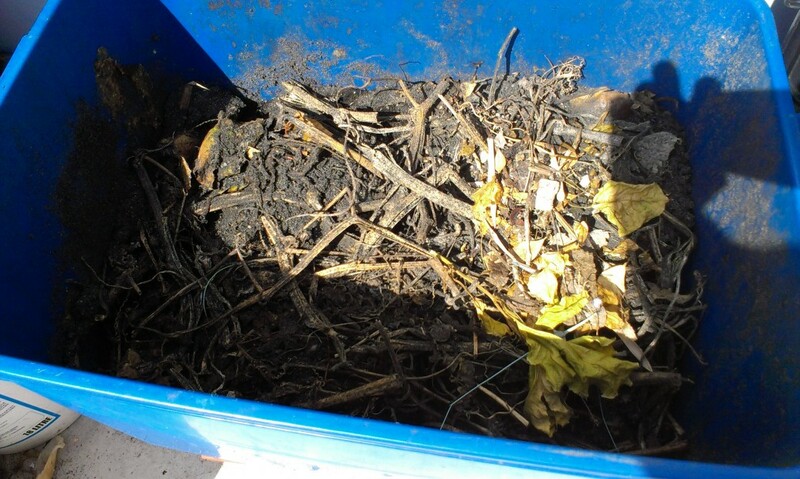 Composting seems to be a bit of a black art. You can buy an expensive composter, which appears to be a drum on a stand with a handle you can rotate to mix. I chose the cheap route, and have been struggling with different methods to try to get it to work. Finally I seem to be successful, after trying for three years. It’s to do with ensuring you have a mixture of wet and dry vegetation and vegetable material, and plenty of hot sunlight, it seems. 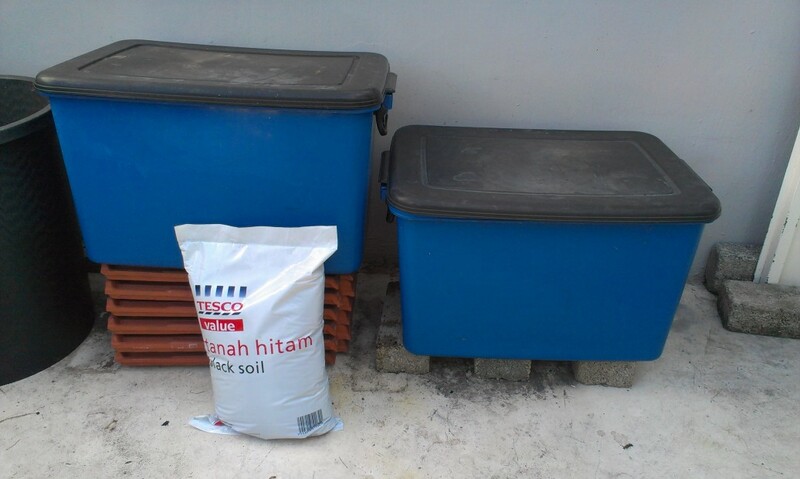 I bought two cheap dark coloured plastic storage boxes from Tesco, and the cheapest Tesco black soil (RM1.50). I put the two boxes where they get as many hours as possible of direct sunlight per day. In the bottom of a box I put a layer of soil – 2/3 of one packet or one packet. Then I put in the vegetable and fruit scraps I collect each day. These are quite moist, so I balance this with dead leaves or dried stalks etc. from collecting leaves and pruning in the garden. Do ensure your mix is not wet. If it is, add more dry matter to balance it. Once the layer of vegetation is 3″ or 4″ deep, I put another layer of soil to cover it. And then more scraps and vegetation. I follow this process until the box is about 3/4 full, which is really only about two or three layers of vegetation, and two or three of soil. I leave it for a week or so if the weather has been sunny (longer if not), and then I use a hand fork to mix it all up, so the soil and scraps mix. And leave it for a while. If the box is too full, mixing is messy as it spills out, and I don’t want that, so I keep it to about 3/4 full. Anyway, it shrinks as it decomposes. Mix again as needed. 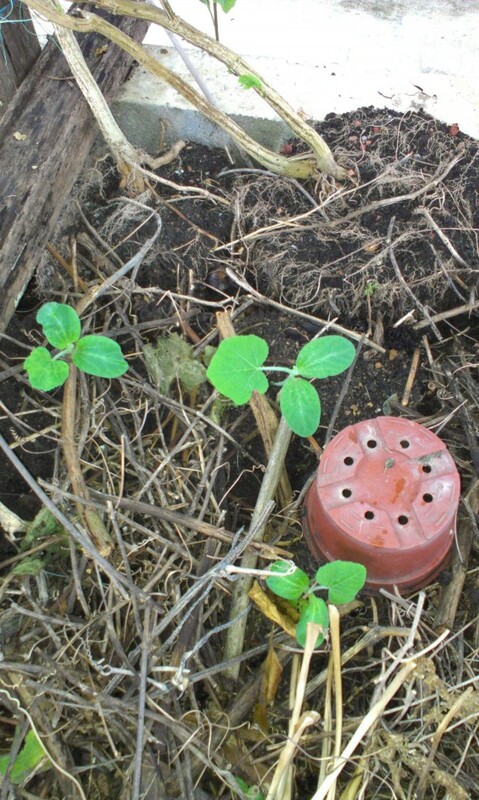 Once it has decomposed enough – how long it takes depends on your environment and your mix, then it is ready to use. For me, if sunny, from the beginning to being ready takes about three weeks. I put it in my garden to raise the level of the soil where it needs it, and it add the nutrition. One problem can be that a rat will come along and dig in the compost – destroying anything you are growing in it. A rat can come when heavy rain occurs, as it gets flooded out of its normal habitat. Normally they are not a problem. But as a result I am wary about adding compost around small, delicate plants, in case a rat does come. I also add compost to potted plants once or twice a year – like to my mock orange trees. 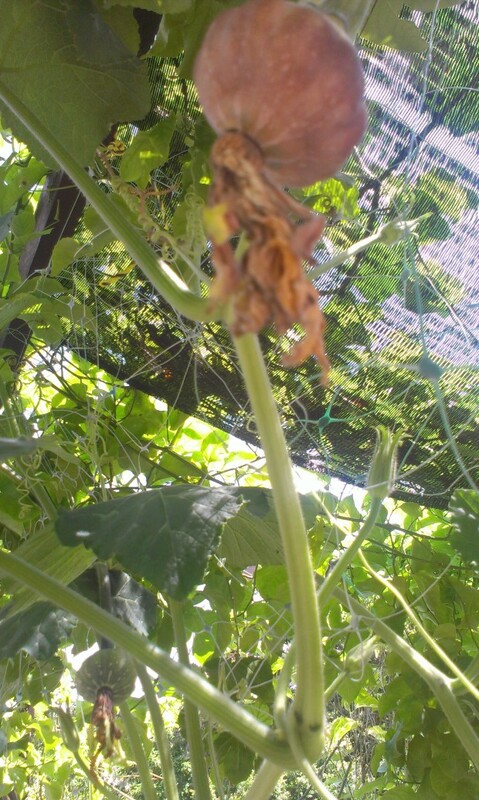 As seeds survive my composting, I sometimes get plants growing out of the compost. I have got good tomato plants that have yielded tomatoes once they grew, and presently pumpkin vines, which continue to give me pumpkins at present; passionfruit vines which have yielded many passionfruit; and so many papaya trees – most of which I have had to cull, but some I have transplanted, and they are now growing nearby, in my “food forest”. 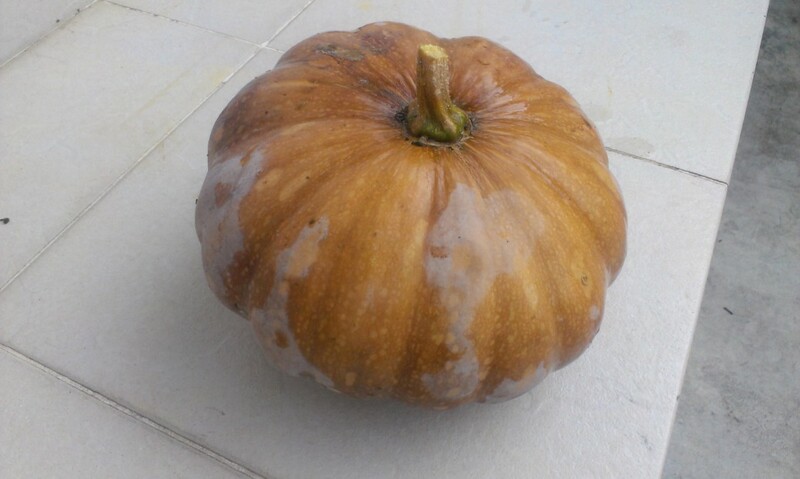 Pumpkin I picked the other day. I seem to have at least three varieties of pumpkin. I don’t put in egg shells as they attract rats, which will destroy your garden while digging up the egg shells. And of course, no meat scraps. 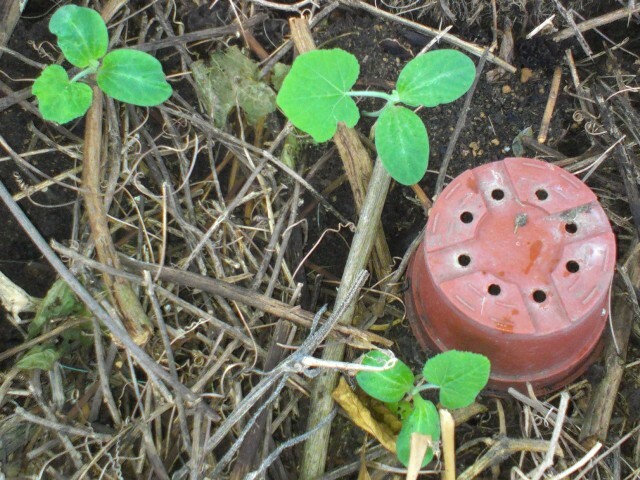 And no weed seeds – I don’t even put in weeds, normally, although I don’t have so many. In an earlier attempt I drilled some drainage holes in the boxes as the mix was too damp – which meant a smelly brown liquid came out, and I had to clean it up every day. 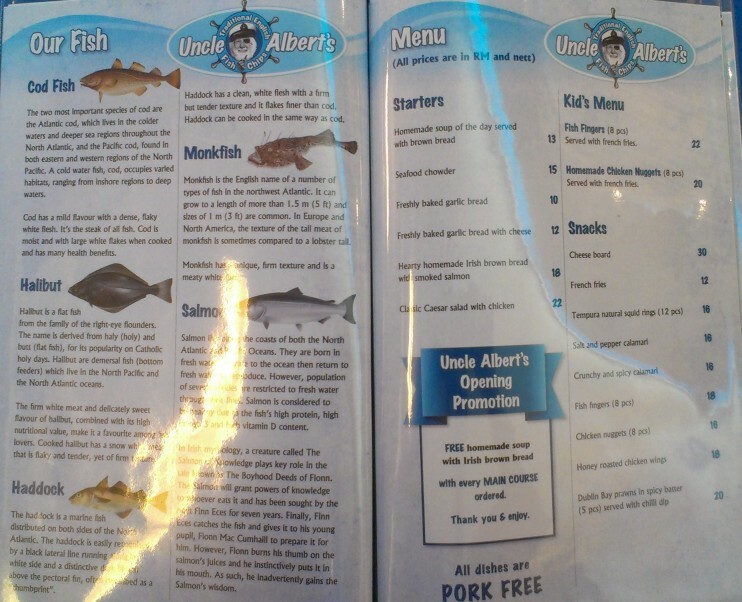 Unpleasant, and a waste of time – and nutrition. Then I put the box on the garden so at least the nutrition wasn’t wasted, but this wasted garden space, which I don’t have much of. It also meant that, as the garden is partial shade (which most plants here prefer), the mix didn’t get enough sun to compost well and quickly. Now I have several containers with holes in them, and I wonder what to do with them. 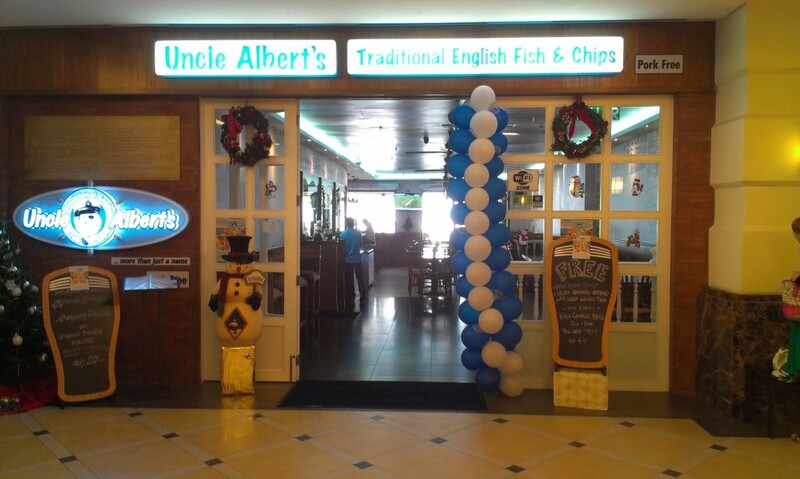 Uncle Albert’s Traditional English Fish & Chips opened recently in Straits Quays, a few minutes walk from Blue Reef, which I have eaten at several times. So it shares a similar view of the quay and marina. 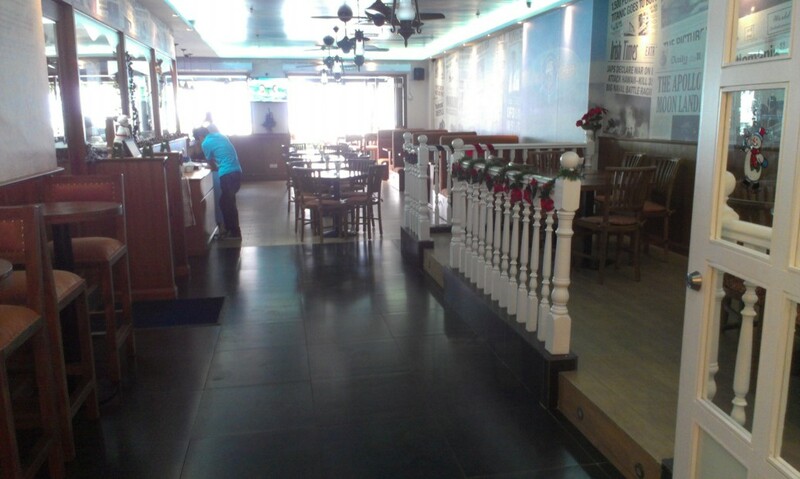 I can’t review the restaurant as I did not eat there. 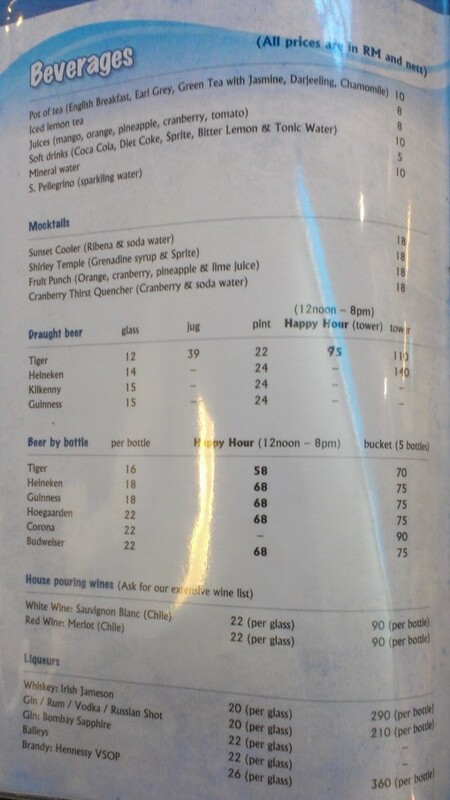 The price is two or three times that of Blue Reef, which puts me off. But if you try it, please let me know. 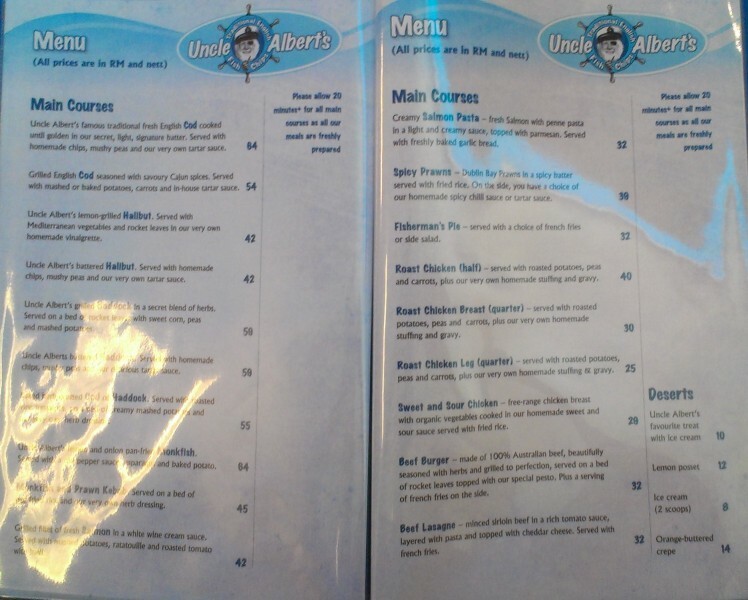 A friend recently dined at Uncle Albert’s and commented that the food was nice, but the portions small, and there was a RM30 corkage charge if you brought your own wine. 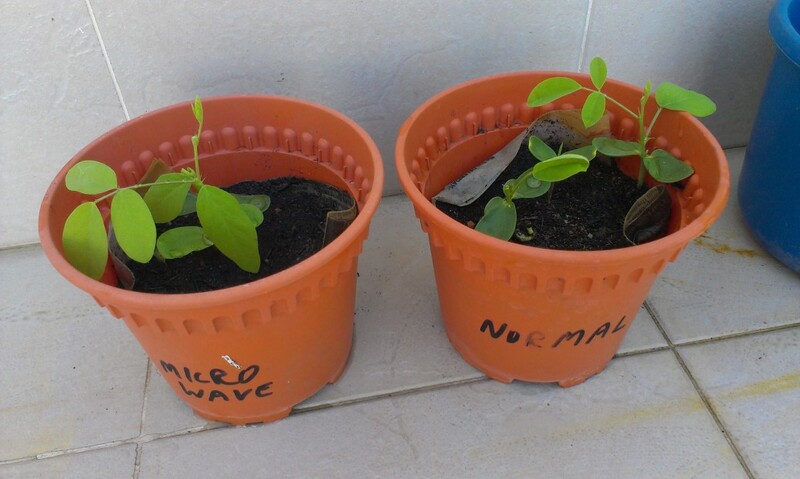 I have seen articles where people watered two plants, one with microwaved water, and one with boiled water, and the plant watered with microwaved water died, where the other grew normally. This is easy to try, so I am. 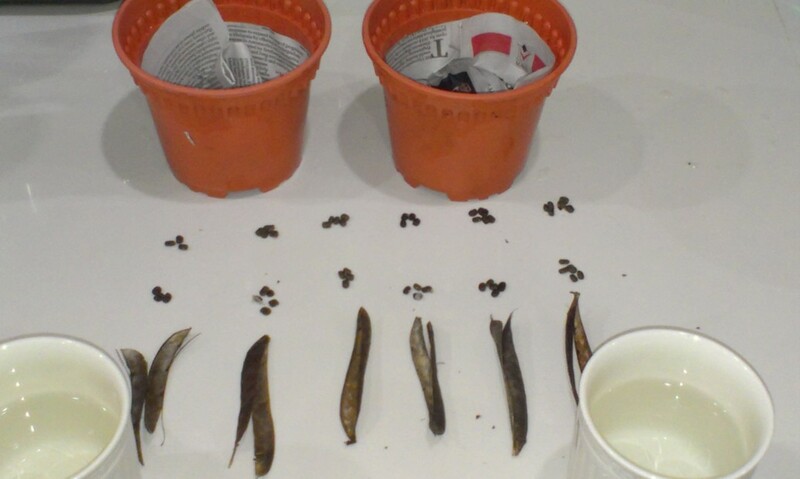 Of course, it’s not a double blind study, and I have expectations, but I will treat each pot and germinated plants as equally as possible. 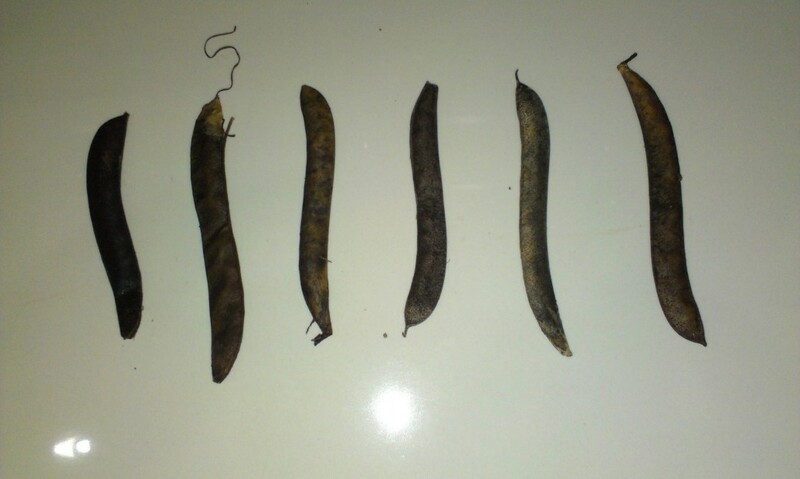 I chose blue pea flower seeds because I grow them, they germinate easily, I could pick the seeds from the same pods myself, and so as many variables as possible are controlled. 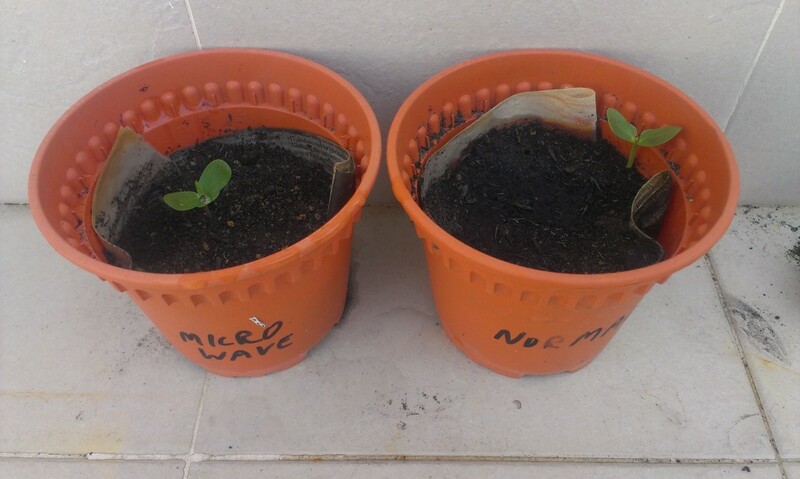 DAY 5 – 14.1 – One seed in each pot has germinated. Half cup water. 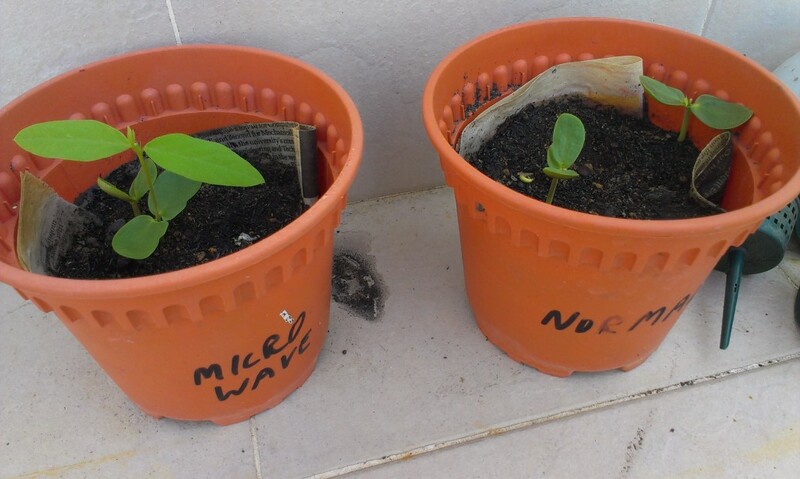 DAY 6 – Two seeds germinated in microwave pot, still one in boiled water pot. DAY 8 – Photo. One germinated seed has disappeared from microwave pot, so now one per pot. So far there seems to be no difference I can attribute to the different water. DAY 12 – So far it appears there is little difference. I’ll see what happens in the next week, and then publish. DAY 19 – Nothing seems so different that the water has had an effect. Day 19 – Microwaved water has two plants, boiled water has three. All seem healthy. Blue pea flower seeds are quite strong, and with 2/15 germinating with the microwaved water, and 3/15 with the boiled water, I expect that probably more will germinate later. I will transplant to bigger pots later and use for decoration. But the result of the study showed no difference. The global warming fraud is being used to justify all sorts of government control and taxes. I want to write a little about that, and about the effect so far in Malaysia – even though I don’t really know much about what is happening here, just my impression from living here, asking a few questions, and checking online. When they were thinking up (see p51) this environment scam (minute 195 tells of the history of the “Report from Iron Mountain”) decades ago, I don’t know why they didn’t decide on using global cooling. To me, that is much more plausible. http://iceagenow.info/ The idea, as ever, is to promote the idea that we ordinary humans are the problem – damaging the environment – and that we need governments with more power to control us and solve the problem. And to also thus transfer wealth from ordinary people to the corporations/ super rich using such techniques as carbon trading. The ones who gave us the polluting system that they blame us for using, in other words. A century or so ago, when there was a choice of petrol or electric cars, we got petrol cars, because Mr Rockefeller had a waste product from oil that he dumped into rivers – called petrol. With petrol cars his waste was suddenly a resource he could sell. Basically, energy gives us our standard of living, as you know. The UN agenda is to return us to before the industrial age – even burning wood creates carbon dioxide and will ultimately be banned – and thus “save the planet”. I have to assume the “elite” will be exempt as always. We live in caves and shiver, and they live in mansions with all the lights on – like Al Gore. But the catastrophic warming they predicted hasn’t happened. Will people realise that it is not happening, and is untrue, and resist before this agenda goes too far? Once people understand this, Agenda 21, ICLEI, and all the other UN programs infiltrated into all levels of government and into corporations must be cancelled. 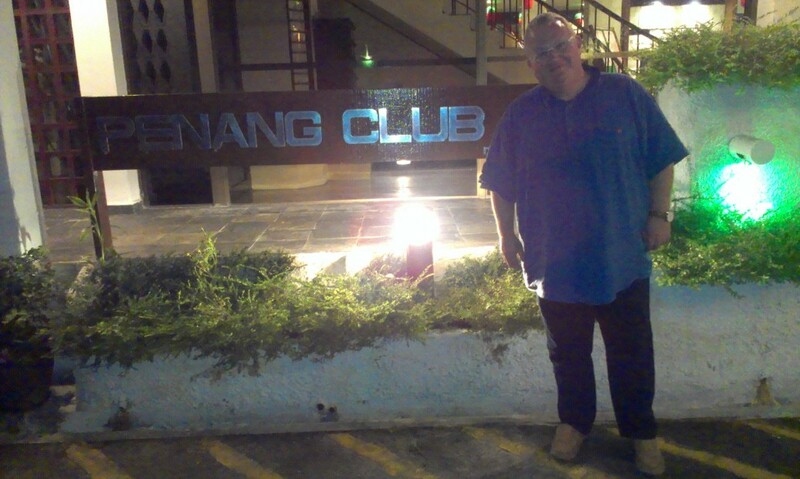 As yet, Malaysia is not too affected by the global warming fraud, with one exception, which I will come to later. Perhaps it never will, as so many people are waking up to this. On the other hand, in schools children are being taught that global warming is real. So in a generation it is likely that the insidious programming and measures by the UN will start to appear here. All based on lies. (IPCC exposed.) Meetings to promote the U.N. agendas are being held in Malaysia and around Asia. In Malaysia there seem to be no taxes on energy or other measures directed at getting more revenue for the government and corporations based on the global warming fraud. In Western countries such taxes and measures abound. Of course, here energy is “subsidised”. The government privatised the people’s energy resources, and then very kindly doesn’t make the people pay full market price for what a company now owns, and should really be the people’s almost free. Of course, Iraq and Libya provided the people’s resources to the people almost free, and look what happened there, but that’s another story. Most years winters seem to be getting colder and colder in temperate regions, and people need to use more fuel for heating. They are hit with a double whammy – they spend more on fuel because it’s colder and they use more fuel, and with global warming taxes, each unit of fuel cost them more. The colder it is the more global warming tax they pay. Here there is no winter, so this can’t happen, although last year did seem cooler – and thus more pleasant. In fact, this December and January are the pleasantest I can remember – meaning the coolest. All I notice here is “journalists” in The Star – a daily national English language newspaper – or The Sun – a week-daily free national English language newspaper – occasionally moaning or pontificating about global warming. They seem simply to unquestioningly take the UN IPCC line – whether it’s because their editor tells them to, or they are just lazy or stupid, I don’t know. It’s hardly worth reading such journalists’ articles if that is how they are. But anectdotally I feel that wherever I go it is generally cooler, although it varies over the years, and the weather reports show this too. Just the other day a global warmist “scientist” in Antartica to promote global warming was stuck in the thickest ice there for about 35 years, and had to be rescued. You’d think he’d at least be smart enough to check and find out that the ice is getting thicker every year, and then go somewhere where he could at least not debunk his own story. Apparently not. And this story was in the legacy mainstream media. Antarctica icing up ore and more in the southern summer, and record cold in the northern hemisphere’s winter. So it must be becoming ever harder for anyone to believe their scam. As always, think – who benefits if I believe in this? For everything they tell you. 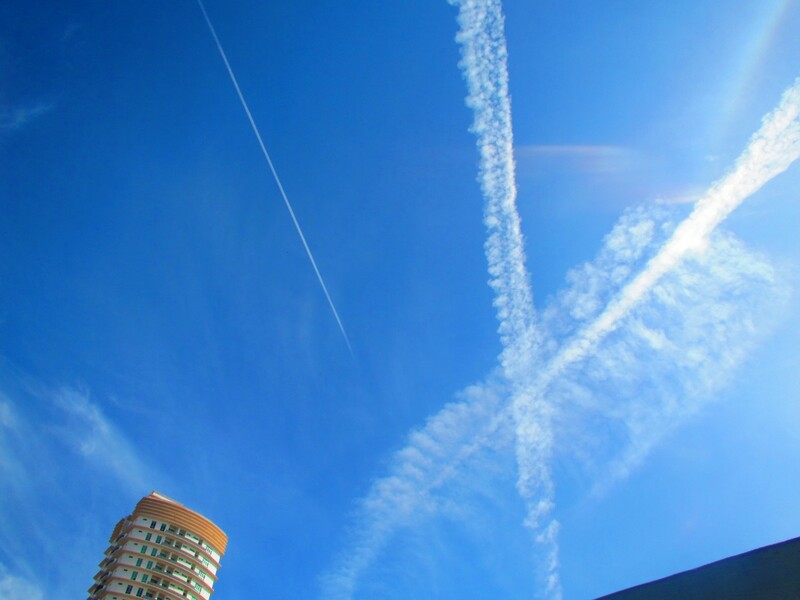 Now, as for the exception mentioned earlier – unfortunately Malaysia has chemtrails / geoengineering. This is where planes spray the sky with chemicals. Governments and politicians deny this occurs and say it’s a conspiracy theory. 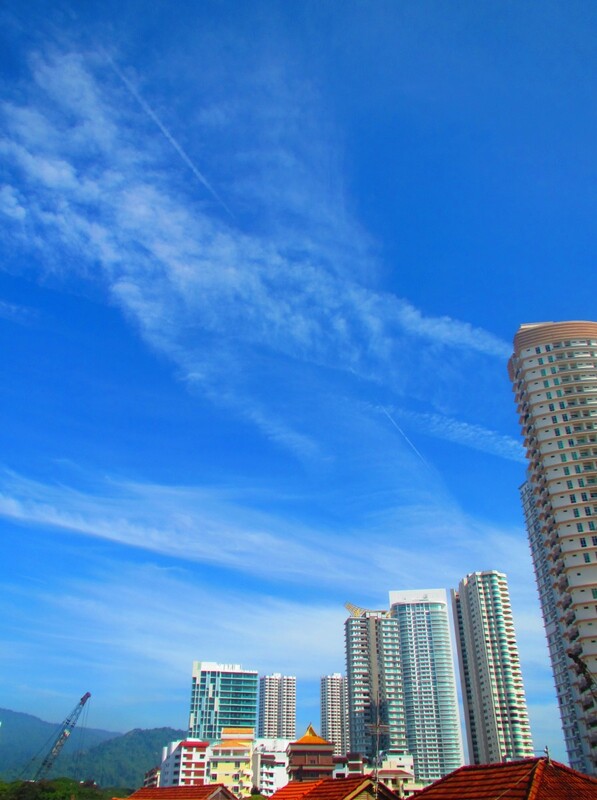 They say all trails are contrails – condensation trails. However contrails last only a couple of minutes or so. The photos below were taken 17 minutes apart, so obviously not contrails. The latest U.N. IPCC summary notes geoengineering exists. See http://www.climatechange2013.org/images/uploads/WGI_AR5_SPM_brochure.pdf and do a search for “geoengineering”, which you’ll find on page 21. The cover story appears to be that the chemicals will reflect the sun – causing by global dimming – and cool the earth . But chemicals will also damage your health, and make it difficult for crops to grow, due to less sunlight. The spraying is not nearly as intense here as in Europe (where I have witnessed how intense it is) or the U.S. So, another good reason for living here in Malaysia is that at least so far, many of the scams and injustices that have been perpetrated by governments / corporations in western countries have yet to be instigated here. And the chemical spraying of the sky is much less intense and infrequent than western countries. Unfortunately, from next year there will be a GST (VAT) here, a fate that Malaysians had been fortunate to avoid so far. But unless Malaysians become aware, it too will fall, to the expense of the people. 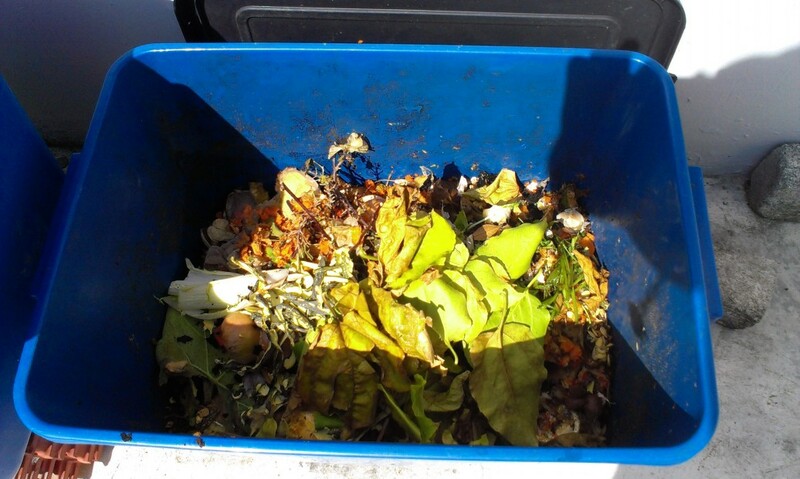 I compost the remains of fruit and vegetables, and this supplies nutrients to the soil, and also some plants come up from the seeds in the compost. Most of such plants do not survive long, but occasionally something does. 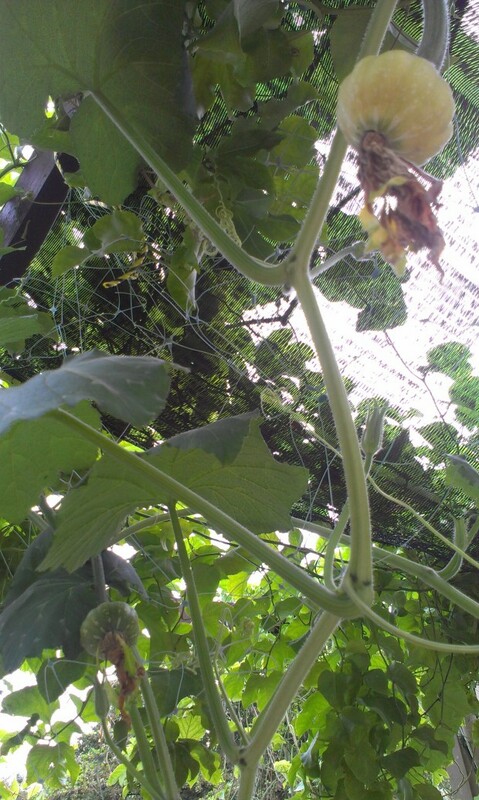 Sometimes passionfruit do, papaya very often do, and recently a vine has been prolifically growing, presumably from seeds from the compost. The vine spread first on the ground, and then started climbing, and quickly grew around the passion fruit vines, and up high. Then big yellow flowers appeared. They dropped off after a few days. 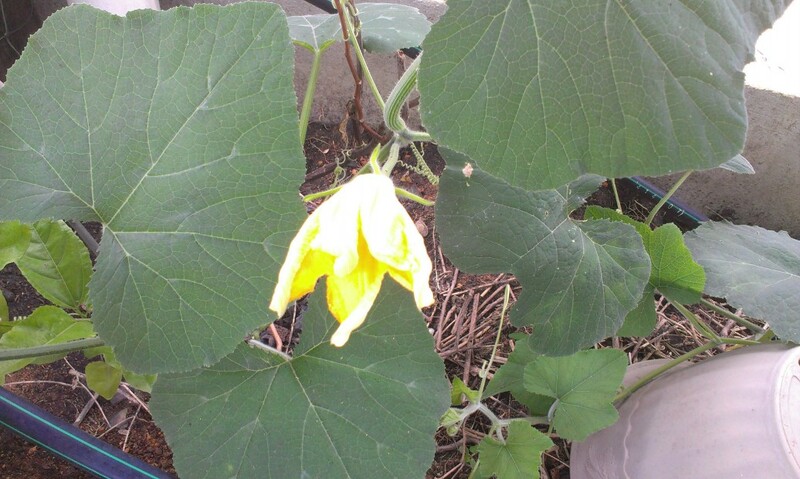 Later a small green vegetable started growing, with a flower on top of it. 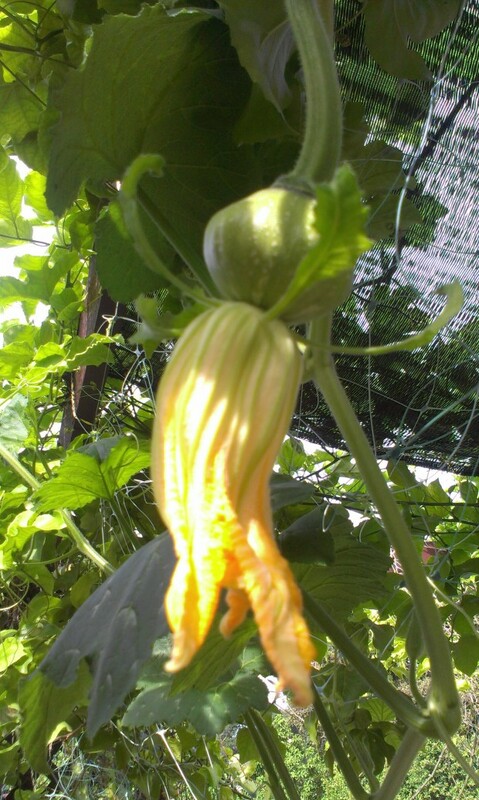 It is like a small courgette or pumpkin. 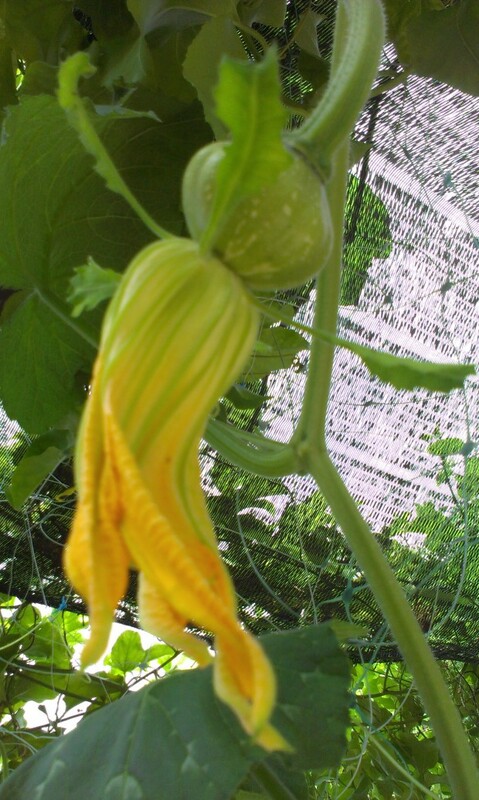 I couldn’t pick it as it was firmly attached to the vine. 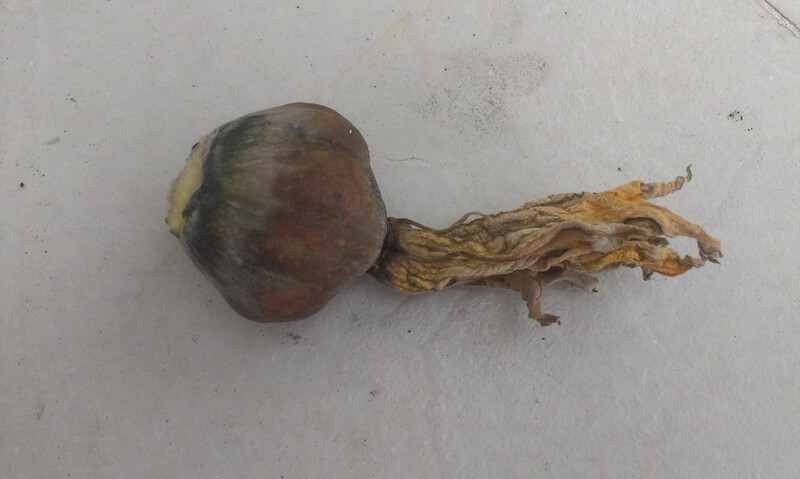 Eventually, after a few days it turned yellow, and then a day later yellow/brown, and it could easily be picked. 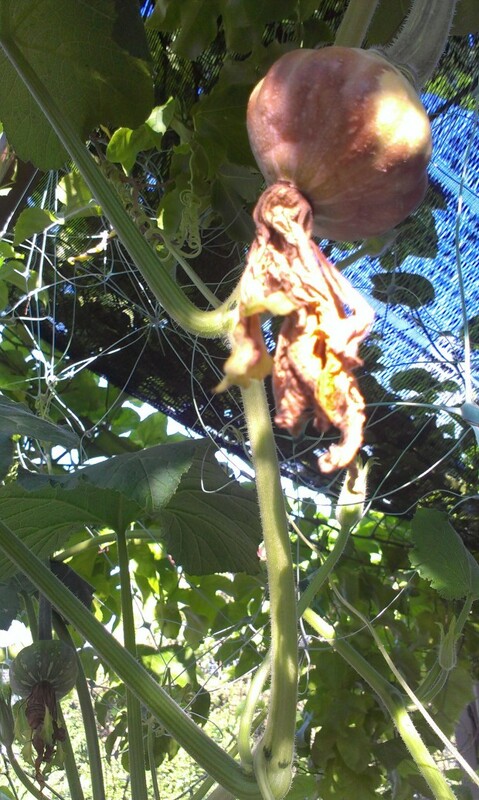 But by that time it seemed to be already decomposing inside – so no longer suitable for eating. So we cut them off while green, and tried eating a little – we didn’t want to poison ourselves. 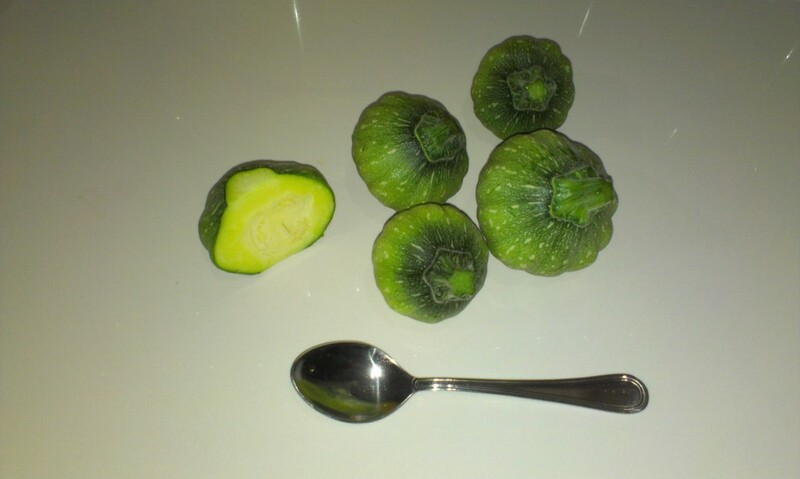 The taste is like a rich courgette. We didn’t get sick. We have no idea what it is, and whatever it grew from is not what we composted. Perhaps it is the natural form of something we eat, and has reverted to type. Eventually it turned out these were pumpkins. 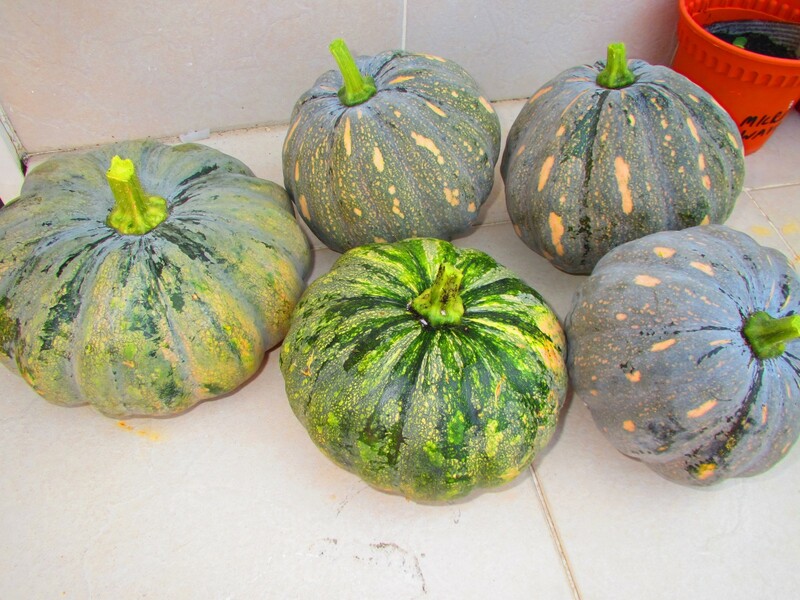 There were at least two varieties, and they sometimes grew to skypumkin size and then turned brown, and sometimes grew into full sized pumpkins. They were delicious. 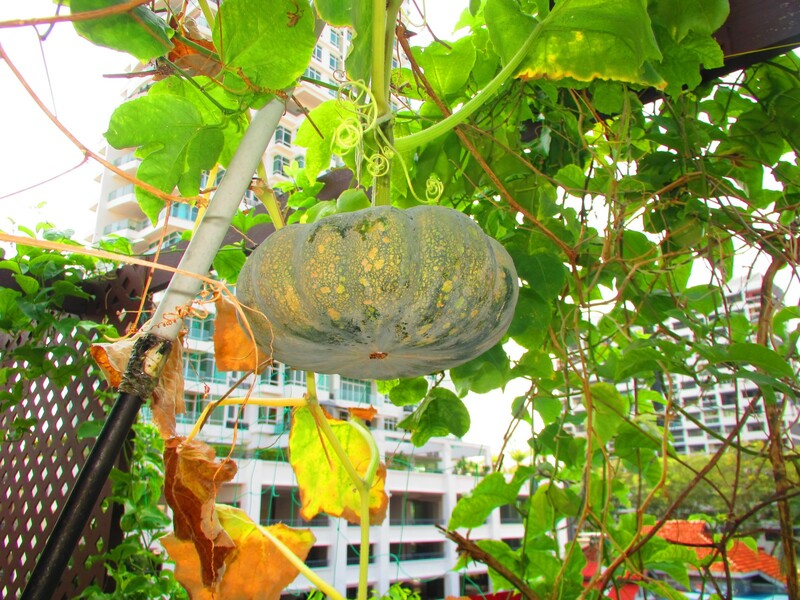 Being thick skinned nothing attacked them, and once it became apparent that a pumpkin would grow to full size it was just a matter of waiting until it seemed to be full size, and then change colour to a bit more tan colour for the green ones. Then pick it, and put in the fridge for a couple of weeks to make it sweeter. Put the seeds into the compost while cutting the pumpkin. So far I have had about 15 pumpkins. 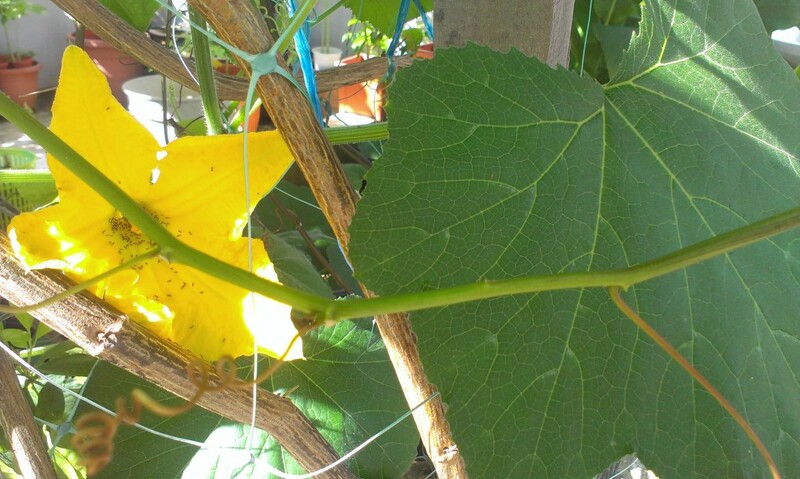 There are no more flowers, or baby pumpkins growing, so it may be the end, but then the vines are still healthy, so perhaps not. 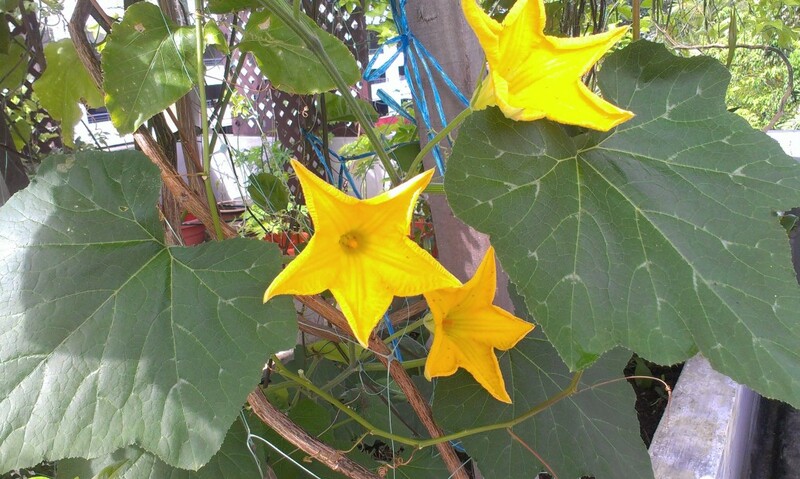 And there are three tiny new pumpkin plants that have recently appeared out of the compost. Idly browsing my blog statistics one day – something I almost never do – I saw that someone had been referred to my blog from a blog called Toad’s Travel Adventures. I read “Wind in the Willows” when I was a kid, so I clicked on this, to discover the author was soon planning to take the Trans-Siberian Railway to Beijing, and then catch the train through Vietnam and travel on to Singapore. Well, I hope to do a similar trip, have more or less done the train myself from Hanoi to Singapore, and as he was stopping off in Penang on the way, we decided to get together. Meanwhile I read about his progress on his blog until he actually arrived in Penang. Here are his answers to my questions. 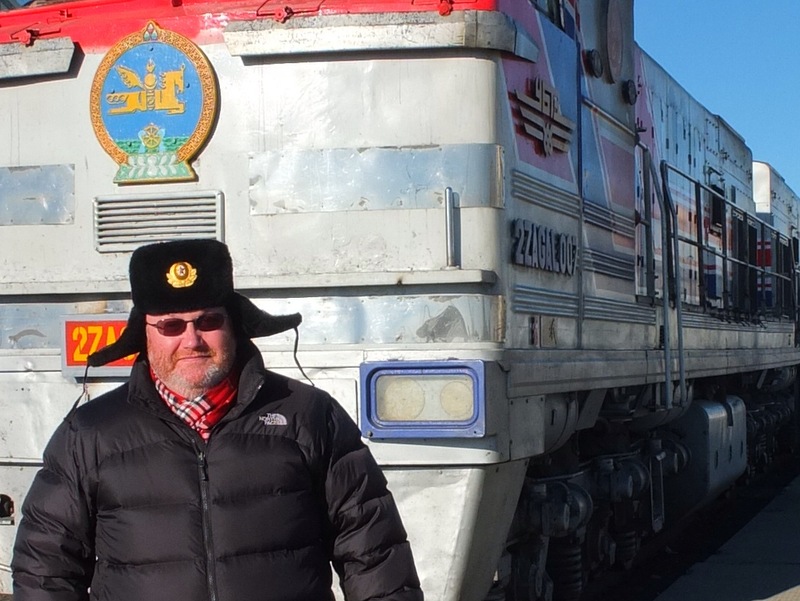 Matthew, a two times veteran of the Trans-Siberian Railway, talks about his two trips. Tell me about about your usual travelling style. My normal travelling style would be much more luxurious I would say. I’ve spent 20 years probably spending too much money on business class and enjoying nice lounges. But that doesn’t necessarily equal the experience I’m looking for. I’m not now trying to be a backpacker, but find some sort of middle ground that gives me some of life’s great memories without having to spend the sort of money I used to. It’s a much richer experience travelling by train. It is not about the luxury but more about the people you are with and the experiences. I believe you did this trip before, but to Shanghai last time – why are you doing it a second time? I can now call it a dress rehearsal for the current one. It was my first foray into solo train travel to places I hadn’t been to before. From Shanghai I hopped onto a plane down to Thailand and bumped into a couple of women from London on a cooking school who told me their journey, and I realised I hadn’t been adventurous enough. I realised I’d be able to go the whole way. After two months of thinking it was a mad journey I’d done, I realised how much I’d enjoyed it and I decided to stretch myself a bit more and do the whole mission. Even though it meant repeating the beginning of the journey – as far as Beijing – which takes 10 days to two weeks. The challenge this time was getting from Beijing down to Penang. The other thing is that generally land routes from Europe to Singapore have been quite difficult, but I realised that with the train it is possible to do it. What was different about this overland trip to the last time? To begin with I had more certainty of what was going to happen and that has advantages of allowing you to relax a bit. But the disadvantages are it’s not quite as impactful or meaningful. It’s been a much bigger stretch than the previous trip as it’s longer and involved a considerable deal more planning from a red tape point of view and contact with a lot more local agents. The organisational phase was probably three times longer than the previous trip, but the rewards are probably three times greater, and the reward comes from the difficulty. It’s valuing personal achievement. So you’re having fun, but it’s been more of a challenge. How did you decide the direction – west-east – as opposed to east-west? As someone who lives in the west and always gone east it’s normal for me to think of going this way. If I were doing the silk route classically I would think of doing it east-west, and maybe I will. I think a key reason is the planning – it is easier to plan a trip from west to east because the greatest red tape problems come around exact dates of entering and leaving countries around Russia particularly, and if you start at that end it is easier to get that right rather than the other way unless you are absolutely precise about when you are landing it could be quite hard. I think there are two styles of traveller. The free and easy “I’ll see if I can get a train there tomorrow” kind – and I applaud those people, but then there are the kind of people who are maybe a bit control freaky who want to know more precisely what is ahead. I’m definitely in that category,but I have a degree of flexibility; but I like to stick to a plan if I can, and I think that has benefits. So for my planning phase I can recall it was much easier going from the west to the east and also there was something else about the conditionality of visas. For example, for China, where you needed to be able to show exit and entry – it definitely just flowed better going in that direction. Why do you travel by yourself? As I have got older more of my friends have got family travel commitments, and I find two things. Firstly, fewer and fewer people have the time and focus on the thing you are interested in, and also the slightly selfish thing is that travelling alone is more fun. And I mean that from the point of view that you get that richness of – you can’t just sit back and not talk to people when you travel alone, so it forces you to get into the culture of a place a bit more. So I am not saying I don’t enjoy travelling with friends . but the combination of a lack of friends with the same mission in mind, plus that means that solo travel is rather good. A perfect compromise would be to meet friends for a bit of a journey – or meet up in a city for a few days – and then you don’t have the pressure of no two people wanting to do the same thing on an itinerary. How did you go about planning the trip, which is a really complicated thing I imagine? The research phase normally starts off with a visit to Seat 61,which everyone will go to, and it’s 98% bulletproof for basic travel planning. I think then there is a phase of checking with agents that the services you need are there and that they are affordable, which gives you the confidence that you can actually do it. I tend to spend a long period of time until I commit, wanting to know as much as possible about a trip before I finally pull the pin. Which websites did you use apart from Seat 61? I tend to try to hunt down blogs of travellers. I think that gives a more real edge to it and then compare those with the web sites of travel agents offering ticketing, transportation or tour services to the place you’re going and see you they compare. It’s nice to see the alternatives to Seat 61. I found this blog of a German guy who went to Pyongyang and he’s got 10 years of blogged travel experiences of train travel around the world in extreme detail. And that’s quite a treasure trove. Whereas Seat 61 would just give the broad brush context, the timetable and the cost. It doesn’t really tell you what it’s like crossing the border so it’s nice to find that depth of detail. I’ll have a large spreadsheet containing a calendar and then I’ll try like a large jigsaw puzzle to assemble each of the sub components of the trip. And see what days of the week the trains might be going and see where it fits together and where it doesn’t. And move the pieces around in such a way that you then get a viable itinerary. There’s then that moment of wanting to know that everything’s possible before you commit to spending money on things – before you start buying a visa to a certain country, you book the hotel OK there,is the train available etc. etc. You try to de-risk it as much as possible. I would normally start with the train – if it’s a train trip – I would then be thinking about the visa requirement and then I would be thinking about the hotels, but I would check all three from the point of view of availability before booking any of them. Not that I am that fussy about hotels. But I might change the whole thing around so I can stay where I want to. Why do you do these trips in winter? That’s the available time of year. It’s easier to plan. But also I’d commend a Siberian winter to anyone. It’s quite good fun. It’s not that it’s cold on the train. It’s very hot. You still need all the cold weather gear, don’t you? You do. This time I thought about trying to sacrifice some of it. Because it’s not that long you’re outside for. But I don’t recommend it. You need a good pair of boots and you need a good jacket. This year in Moscow it wasn’t cold enough, and there was a lot of black ice, so it was really dangerous on station platforms and so on. Having more or less carried out your plan, do you think you could have made a better plan? If you had unlimited time, what would your plan have been? I’d have stopped off a bit more in Vietnam, I’d spent time in Hue, Na Trang, Halong Bay, maybe tried to do something a bit off the beaten path in Cambodia. I’m quite interested in these motorbike itineraries you can pickup in Vietnam and Cambodia. Laos would have been an interesting side journey, but not on the main path, although I understand it’s possible to take a bus from China to Laos, and then a bus from Laos to Bangkok. I’d like to see St. Petersburg. What went well, and what didn’t? The plan went very well. It delivered everything I wanted it to from the trip. The only problem was self-inflicted – too many oysters in central Vietnam which destroyed one of my train journeys. I think I over packed,but it’s been easy to get over whatever the situation. Every trip is different. There were a lot more mainstream tourists on the Trans-Siberian leg than the previous trip. It didn’t feel quite so Marco Poloish. The previous year there were very few of us. It’s funny how that changes the atmosphere and dynamics of a journey. On this trip, when I left Beijing for Hanoi I didn’t see a western person for the whole journey. Apart from that health problem, everything else has gone swimmingly. What were your best memories of the trip? Motorbiking with a side car in Hoi An was a definite highpoint – out in the fields. The food has been a high point. I’ve had some incredible dishes from around the world. And I’ve met some incredible people – local people I’ve met on trains in the country and also travellers on their own adventures. There are thousands and thousands of people doing similar but slightly different journeys and it’s great to meet them and compare plans. There’s a real spirit on the Trans-Siberian when everyone realises they’re arriving in Beijing. And the small-world paradox where you actually bump into people you have met on trains in other countries. Is there anything I didn’t ask – or anything you’d like to add? My next trip – I’m quite excited about the prospect about a central Asian escapade. But I’ve got all that research to do. Either to Vladivostok or head off from Moscow down to central Asia. That’s the next big question. I’d need to vary the season a little. Something tells me I should try that trip in September. I need to do the research. And my mind is always trying to find film connections with stuff that I do. Has there been a film made there? 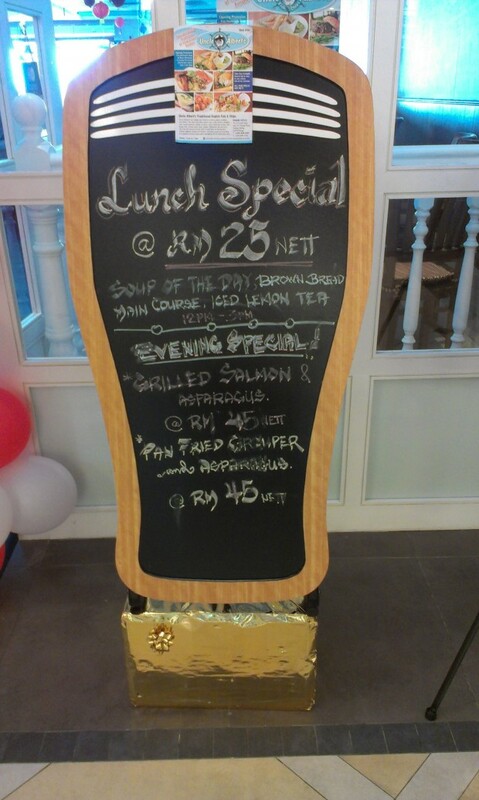 As you see in my blog.